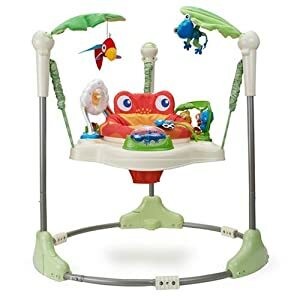 Rainforest Jumperoo just $65: Save 32% with Free Shipping! Right now, you can snag the super-popular Fisher-Price Rainforest Jumperoo for just $65. That's 32% off the list price of $95.99. I also looked back over some old posts and realized that this is the lowest price I've ever seen for the Rainforest Jumperoo! This toy is high on the bestseller list for a reason, check out the 1000+ customer reviews with an average rating of 4.5 out of 5 stars!